QWEL was created in 2007 by the Sonoma-Marin Saving Water Partnership and has been modified to meet the needs of Nevadans. The training was designed to provide an affordable, proactive and local approach to reducing landscape water demands, as well as share the knowledge of water efficient and sustainable landscape principles. This program is EPA certified through the WaterSense program. As part of the training, participants will conduct a water audit using a catch can test. Photo by Leilani Konyshev, Cooperative Extension. Participants can take the 18-hour training course just for the knowledge, or they can also take the exam to obtain certification. Upon certification, professionals will need to continue their education with at least 2 continuing education units per year to uphold their certification. Mar. 12, 2019 from 9 a.m. to 2:30 p.m., check-in at 8:45 a.m.
Mar. 13, 2019 from 9 a.m. to 4:15 p.m.
Mar. 15, 2019 from 8:30 a.m. to 2:30 p.m.
Mar. 18, 2019 from 1 p.m. to 4 p.m. Lunch will be provided for Mar. 12-15 and light refreshments will be provided on Mar. 18. Register at QWEL.net. Pay at Eventbrite.com. 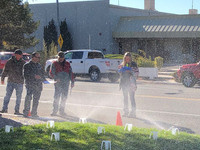 Training is co-sponsored by Truckee Meadows Water Authority and the Nevada Landscape Association. Persons in need of special accommodations or assistance must call or notify Jenn Fisher at 775-336-0249 or fisherj@unce.unr.edu at least three days prior to the scheduled class.